On Friday, the day before the race for the cure, I was asked to help judge the “paint the town pink” competition, where businesses decorated everything Pink. This was a heart-warming experience, to see so many people visibly demonstrating their support for breast cancer research. One of the participants was a middle school that had ALL the kids dress in pink. The boys really got into it. We saw pink hair, pink ribbons painted on faces and pink-ribboned hallways. The Federal building put large pink ribbons in most every window. This sight was such a statement of support. I felt like each one of those ribbons was a hug from these people who cared and understood, and we were not alone in this fight. I was told that my duties on Saturday would include showing up at 6am for a TV interview and punching the punching bag. AstraZeneca (drug company) had a punching bag that counted all the punches thrown and for every punch, they would donate a dollar to the Komen foundation. They wanted me to throw the first punch. Then I was told they wanted me to lead the survivors in the “Pink Parade” .They would introduce me up on stage as the “honorary survivor”. My next duty was to drive the pace car for the race. They told me that I would not have to give any speeches, just have fun. That evening, my Aunt arrived on a flight from Phoenix. We were to get up at 5am (Indiana time)… which would be 2am her time. She was a great sport about it. Saturday morning. Race day. We arrive a little late to the race location and I was immediately escorted over to the punching bag first thing. The camerawoman was there and they had me throw the first punch. I was determined I was gonna clobber that bag. I hauled off and hit it. But I didn’t get a chance to test the bag before. The bag was very dense. And electronic counter registered “1”. Then the photographer asked me to punch the bag for a minute straight. I got 52 punches in. Then I was off to be interviewed with the reporter. That went well. Jane Callahan, the race chair watched the interview and picked me up in a golf cart and whisked me over to the survivors tent where I was joined by my family (Ken, Madison and my Aunt Janet). Here I got to relax for a minute. It was around this time that I realized my wrist was hurting. Seems I may have sprained my wrist punching the bag. Guess I needed to lighten up on the bag a little. It was now time to line up for the “Pink Parade”. They lined everyone up by year of survivorship. They positioned me and other members of the Komen Foundation up front to lead the survivors through arches of pink balloons. The arches were lined by walls of people cheering and clapping for us. This was perhaps the most humbling and emotional part for me. Seeing all these people clapping and cheering was a true statement that we were not alone. That we LIVE and we were loved for doing so. That we had made a very difficult journey and we had arrived. Tear stained faces and pink feathers were everywhere. We entered this disease alone, but now we were united! We all new the fear and frustration, the anger and the agony. clear vivid blue sky was another statement made silently. were made. My name was called and I ran up to the stage to be introduced as the “Honorary Survivor”. I ran up and I was slightly out of breath and then they turned the microphone to me and they said, “Tell them your story”. Well, I was told the night before that I would not have to make any speeches! Oh well… someone forgot to tell the woman who introduced me. So, not knowing how much time they wanted me to speak, I tried to keep it all short. Then they urged more. So I did. I was told that it was a good speech… but I would have much rather have known how much time I was expected to speak. Anyway… I now can say that I have had experience speaking in front of 35,000 people. After the speeches, my family and I were piled into 2 golf carts and zipped through crowds of people to the start line. The golf carts had no horn, so I sat in the front seat yelling out “Beep Beep, excuse us, coming through” to people as we weaved back and forth trying not to run over pedestrians. The woman driving the cart was next year’s race chair and she was almost giddy driving over the grass and the sidewalks trying to get to the start line. At the start line was the Ford Mustang convertible (Silver). There were a group of photographers there, and I, being the naturally shy person that I am (not) jumped up on the back of the convertible and raised my arms and boa to the sky as photographers snapped photos. Then we had to wait for the participants of the race to be staged by time. I got to see Sue Nuyda while we were playing with the car and she came over and said “Hi” and introduced us to her daughter. I was very happy that she was there taking it all in and sharing the moment with us. Even though I only got to see her for a moment, it still meant a lot to know she was there. Finally the time came to get in the car and get “acquainted” with it. Ken and my Aunt Janet sat in the back seat and Madison sat up on the back of the seat like the true “Princess” that she is. I drove and I had a navigator for the race sitting up front with me. There was one “hand cycle” in the race, so we took off leading him around the course. This was kind of disappointing as he was all we really got to see of the actual competition. The fun part was driving around, honking the horn at the people lining the course and waiving. I had hoped that my Mother could have joined us, but my Father had turned very ill earlier in the week, so she stayed at home with him. She was a very important part of my battle, as she was my “private duty nurse” all through my treatment and I would have loved to have shared this moment with her as well… so we called her on the cell phone and gave her a running commentary from the pace car. Being a 5K course, we were finished in less than 15 minutes. Just in time to park the car and join all the walkers. We came in and inserted ourselves into the mass of people. I was amazed at how many people recognized me from the TV interview earlier in the morning. That already seemed like a lifetime ago! We spent most of the time looking for my Aunt, as we lost sight of her in the first corner. (We stopped to take a photo, and she kept going). So we spent most of the rest of the race/walk looking for a red head with a pink visor and a white t-shirt. That was the description of most of the participants. I knew that she had problems with her foot, so I was worried about how she would do with 5 K.
. Madison was tickled that one of her friends from school was working at a water station along the course and Madison called her name out when we passed in the pace car. She couldn’t wait to get to the aid station when we were walking to make sure she made contact with her friend so she could validate that she was seen. The walk was very moving. Reading all the dedications on people’s backs was very humbling. Photos of women who had lost their battles, but were still alive in the hearts and spirits of those walking. Seeing the mass of movement, like pink boiling water and knowing that there were over 35K people there, but realizing that for every bobbing head we could see, represented one more life that would be lost to breast cancer in the year to come. When all was done, we sat on the curb next to the finish line and watched walkers come in, some sprinting with big smiles on their faces, some walking arm in arm with their loved ones. The real celebration was the opportunity to be there, together. In a way I was sad to see the vendors taking the tents down and starting to tear down. This meant it was all over and everyone would go home. Part of me wanted to cry out… “Don’t go! Stay longer! I didn’t get to meet all of you! I didn’t get to hear your stories!” But people had lives they had to return to. I guess that is how Cinderella felt after the Ball was over and her chariot turned to a pumpkin and she returned to her cinders… But I have my “Prince Charming”, and even a Princess to go with it. And I am living my “Happily Ever after” right now with them. 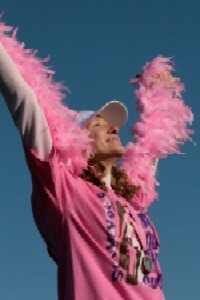 And every time I see a “Race for the Cure” t-shirt, or a pink ribbon, I am back to that moment, breathing in the warmth of the Pink Sunshine of that perfect Saturday morning in April. Where we were united together in a memory that will last a lifetime.